The Formula One roadshow remained in the USA and Keke Rosberg recorded his only win of the season in searing Texas heat. But it was a far from enjoyable weekend and for a time the conditions were so bad that there was a threat the race would be cancelled. The drivers were unhappy from the moment they arrived. Temperatures in excess of 100 degrees - and a recorded track temperature of 150 degrees - and a tight circuit was allied to a track which started falling apart almost as soon as the cars started practicing. The one concession was that the race would start at 11am to avoid the worst of the heat with a crack-of-dawn final warm-up at 7am. But the latter was cancelled as a support race for brutal Can-Am cars on Saturday had pulled chunks of tarmac out of the surface. Niki Lauda and Alain Prost led a move to boycott the race but Rosberg brushed their views aside. "I don't know what all the fuss is about," he said. "We'll all complain and bind right up until the start time and then we'll go out and race as usual. We've come all this way and the race is all set up. Track surface or no track surface, you know as well as I do, we'll race." He was right. 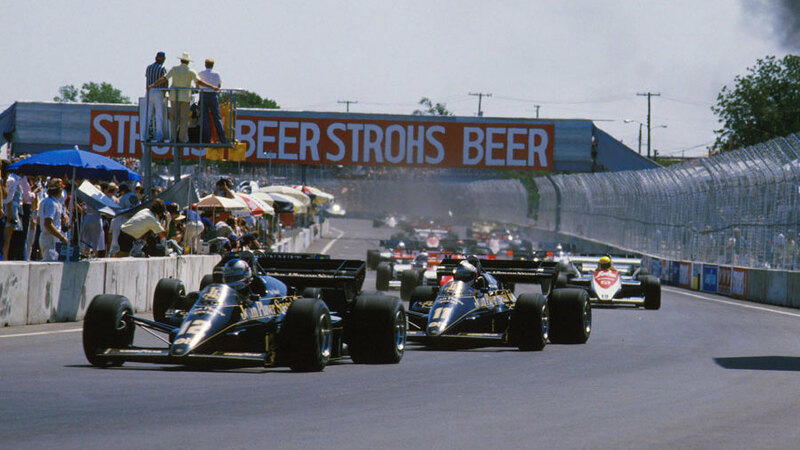 As Larry Hagman waved the green flag, Nigel Mansell led from Elio de Angelis in a Lotus one-two followed by Derek Warwick's Renault and the Toleman of rookie Ayrton Senna. Warwick soon passed an ailing de Angelis but his race ended when he found his brakes weren't bedded in fully which dragged the car to the left and on to the marbles. As a result of the lack of grip he spun and hit the tyre barrier. Lauda took over second place but was re-passed by de Angelis whose engine picked up again. Lauda was also overtaken by Rosberg's Williams as de Angelis made a move on Mansell for the lead. This was repelled by a rather defensive move by Mansell which angered de Angelis more when he lost momentum and couldn't prevent Rosberg from scampering by. Rosberg caught Mansell but he could not get past the wide Lotus, and to add to his frustration Prost then relegated him to third before an error by the Frenchman allowed Rosberg to reclaim the position. That turned into the lead when Mansell pitted but again Prost got past and built a lead of ten seconds before a second error, when he clipped a wall, ended his race. Rosberg's Honda engine suffered amazing turbo lag with the power suddenly crashing in. It made the car difficult to drive but he coped brilliantly on a day of sweltering temperatures on an unfit track. It was Rosberg at his best. Both he and Jacques Laffite, who finished fourth, used refrigerated skull caps. The footnote to the day was Mansell, whose car ran out of fuel within sight of the flag, so he tried to push it across the line. He collapsed, exhausted, by the side of the car but the fans loved it. He was classified sixth. Teams and drivers didn't think much of Dallas. Despite it being a good race, the track was never used again.